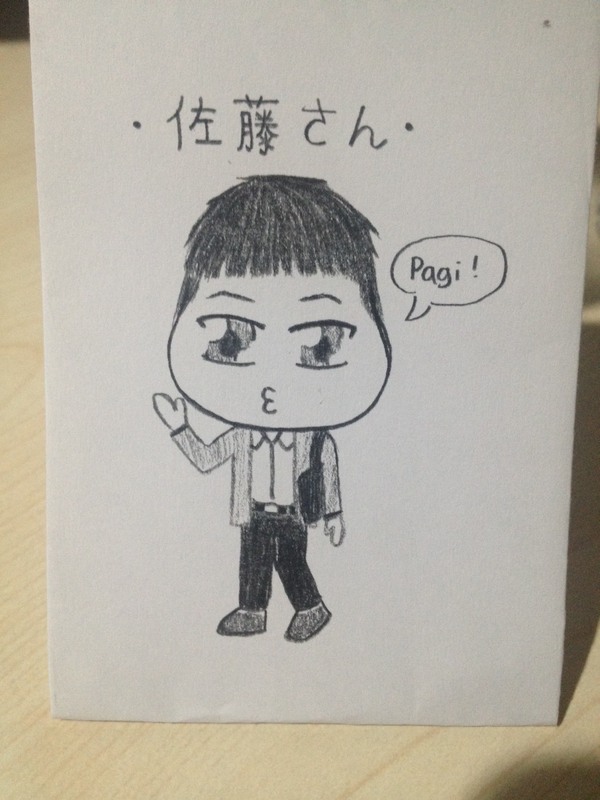 I got request from one friend about Hinamatsuri in Japan. 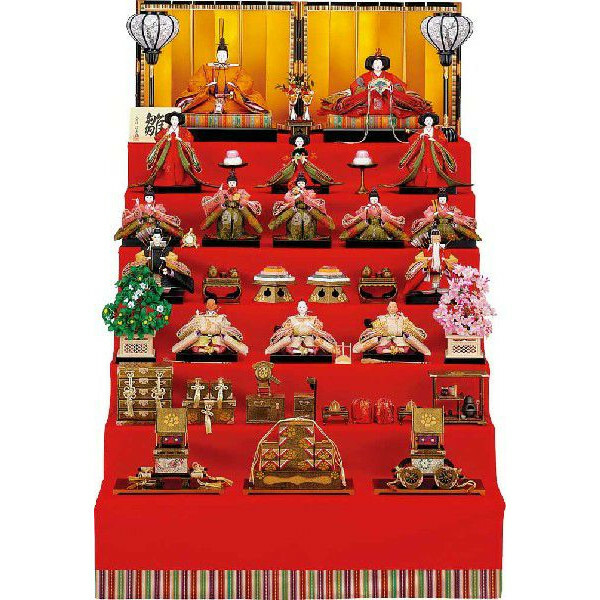 I will write about this customs, history and doll and so on though Hinamatsuri will be held about 6 month later. This customs is said to trace back to 3rd century in China. At that time people thought that bad spirits spread in human body when changing season and people tried to wash out that with water around river. This customs was brought to Japan in around 9th century. We started to flow dolls made from paper to river in stead of washing out bodies. This was called nagashi bina(流しびな, flowing girl’s doll). This customs was connected with dolls later since flowing dolls were said to cause problems wih fishermen. Dolls are originally believed to absorb bad spirits from human, so to speak, it was kind of scapegoat. In around 17th century, people started to make dolls for ornamental use. Some rich merchant made gorgeous dolls for their daughters as the household goods that she brought with her when she married. This coustoms gradually spread to ordinary people. 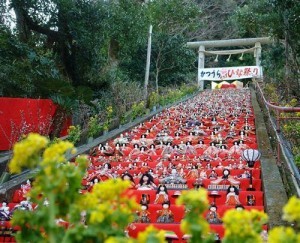 As you might see Hina dolls, it’s very gorgeous and colorful with red carpet. 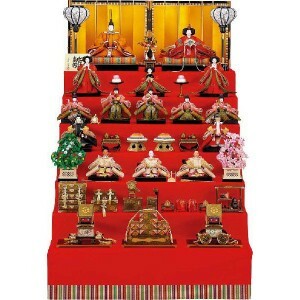 Complete set of Hina dolls has seven platform as bellow. Each characters are sitting in each tier. The top tier holds emperor and empress. In second, three court ladies. In third, five male musicians. In fourth, two ministers are displayed. In fifth, three helpers or samurai to protect emperor and empress. In sixth and seventh, a variety of miniature furniture, tools, carriages are displayed. Nowadays, we eat some special foods to celebrate this day. 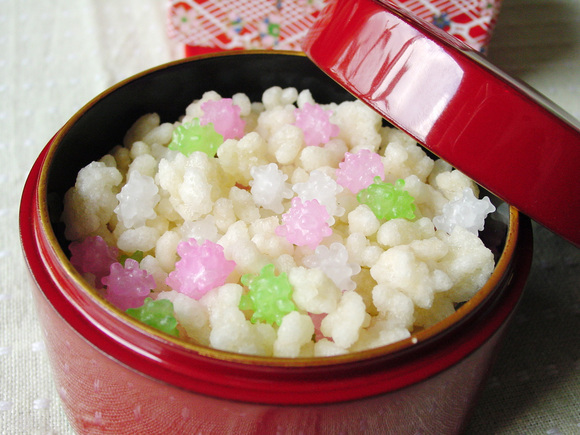 Bite-sized Japanese cracker made from rice. 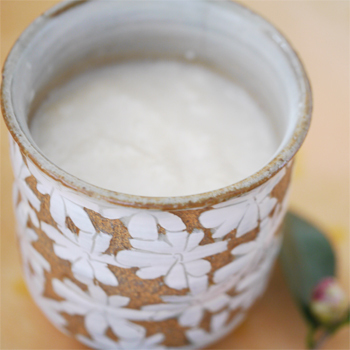 Sweet non- or low-alchol drink made from rice. 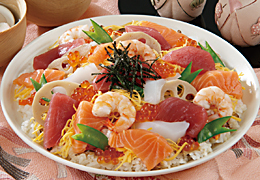 Many kinds of seafood and egg placed on sushi rice. I recommend Katsuura Big Hina Matsuri in Chiba prefecture. It’s near from Tokyo. Look at this! 60 tiers on stairs!! Amazing scene. March in Japan is still cold but nice season to visit Japan.